Can Akamai Shock the Street Again? Akamai Technologies (NAS: AKAM) reports first-quarter earnings after the closing bell on Wednesday. Last time around, the company shocked the Street with superb cloud-computing and content-delivery sales that sent shares soaring more than 14% the next day. 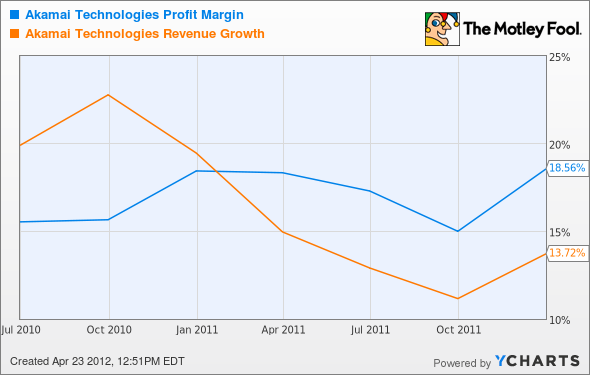 What will Akamai do for an encore? The Wall Street consensus for the first quarter points to earnings of $0.38 per share on $310 million in sales. That's well within management's guidance range but down a little bit from what analysts were expecting before that blowout fourth-quarter report. The fourth quarter was a turning point for Akamai. The company stumbled and bumbled in 2011. Share prices fell as much as 60% before bouncing back, but the last report has helped the stock beat the market in 2012. The online traffic optimizer saw sales and margins falling in tandem last year but erased all the damage in the fourth quarter. The enterprise and commerce segments drove most of the recovery. "We thought it would be a good holiday season," said CEO Paul Sagan. "It was an exceptional holiday season, and so commerce was very strong." This quarter might see some different heroes. "While it's too early to call it a trend, we did see very promising traffic growth in Q4 for our media solutions," said incoming CFO Jim Benson. The company revamped its pricing strategy in January, and the impact from that move should be felt in this report. Akamai has traditionally commanded premium prices over content-delivery rivals Level 3 (NAS: LVLT) and Limelight Networks (NAS: LLNW) , but the January move put them all on a level playing field. I don't know whether the other guys reacted with price cuts of their own or simply stayed the course. Sagan's comments about the competitive landscape here should give us some clues, and then the other competitors both report results next week. Ahead of these data points, my hunch is that Akamai reshuffled the entire market's pricing deck. Fellow Fool Tim Beyers is afraid that Akamai may have lost its Rule Breaker DNA, and our high-growth service did indeed kick the stock out last summer. However, there's another Rule Breaking stock that seems poised to grow revenue and profits for years to come. Read further in our special free report, "Discover the Next Rule-Breaking Multibagger."